Pittsburgh Steelers quarterback Ben Roethlisberger warms his hands as snow falls during a game in December 2013. 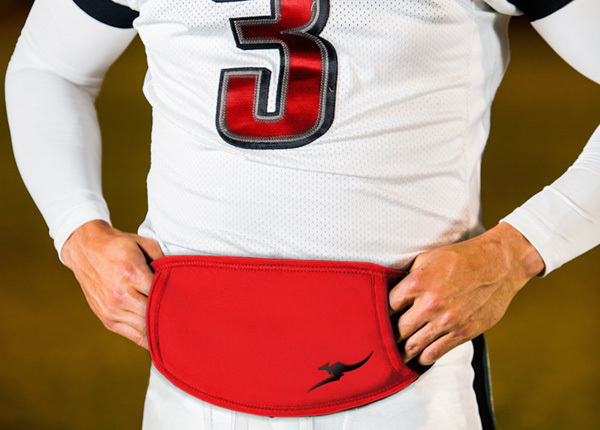 An NFL quarterback's startup company has produced a slimmer, high-tech hand warmer that should bring new efficiency and a sleeker look to an essential piece of the game's gear. Kafka tells SI.com that he wants the hand warmer to catch up to the rest of the game’s gear. So he has done something about it, creating his Roo Outdoors Inferno hand warmer, taking the product from Kickstarter campaign to launch in about a year. What makes the Roo Inferno different? The Inferno is different. Kafka, along with his wife, Alli, started Roo Outdoor and has led the business from product design to marketing. The couple worked with a manufacturer out of Baltimore—one accustomed to working with Under Armour—to create a remarkably slim pouch. At seven millimeters thick and with a utility product on the backside to store warming pouches, the product, says Kafka, was streamlined, keeping only the most important aspects. He added rubberized grip on the inside of the belt to minimize slide. How did the development progress? When he started the project Kafka was playing for the Philadelphia Eagles. He talked to teammates about what he should include in the Inferno. Though some players wear gloves on the field, those gloves are so thin—with virtually no insulation at all—and built for a better feel when catching the ball that the hands still get cold. Kafka made the Inferno’s pouch as slim as possible without losing that much-needed warmth. It was those Philadelphia-based discussions that also took the Roo Inferno from just the football field to the hunting field, with a final design that includes a mossy oak camo print on the outside—a versatile pattern for different wooded settings—and a specialized belt to hold about a dozen units of ammunition. Who’s using the Roo Inferno? Kafka signed with the Vikings this past offseason, but an injury before the season cost him his spot on the roster. While he works toward his next NFL contract, he has put a focus on the Inferno, sending samples to his alma matter, Northwestern, where the response has been positive, he says, with quarterbacks, running backs and receivers using the product. Kafka has also sent the Inferno to former NFL teammates and says we’ll see as many as 10 in use across the league at any point during a given week. Kafka’s brainchild may not be the greatest thing since sliced bread, but if he and Roo Outdoor have their way, we can say goodbye to the NFL loaf.